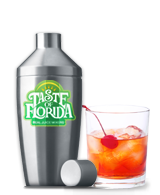 If you plan on hosting a harvest themed dinner, consider serving a hot harvest grog using Taste of Florida Green Apple. Per serving, pour 1 oz. of Taste of Florida Green Apple and 7 oz. of your favorite apple juice into a sauce pan. Then and add 3 whole cloves and two dashes of pumpkin pie spice. Continue by letting the mixture simmer for 5 to 7 minutes. Once it’s done simmering, remove the cloves and pour it into a mug. Next, stir 1 ounce of either apple liqueur or brandy. Serve with cinnamon stick garnishes. Appetizers to consider serving with the drink are apple dippers, cheddar cheese and bite-sized apple turnovers. Would you prefer to serve a variety of chilled or room temperature apple cocktails instead? If so, be sure to check out our recipe database. It contains a wide array of classic and not so traditional apple drinks. Some of the recipes on offer are Apple Drops, Apple Cores, Spiced Apple Pie, Bailey’s Carmel Apple and Cinnamon Appletinis. You could feasibly serve them with or without an assortment of bar foods. Ones to consider are bowls of apple chips, caramel apple popcorn, green apple popcorn and cinnamon apple popcorn. Would you like additional restaurant and bar promotional ideas for fall? Simply call (850) 460-2328 or contact us through the Taste of Florida website.